Blackberry Goat Cheese Crostini | Naturally. For the longest time, the thought of cooking berries felt so strange to me. Berries were a summer treat, best (read: only) eaten raw and there was really no good reason to heat up the house. And then one morning I was baking banana bread and decided to toss some strawberries in along side to top oatmeal I was also making. It turned out I had been missing out on a new level of fruit eating. Roasting fruit does something magical where the sugars from the fruit come out even more, making the fruit just a touch sweeter and for some, a bit more mild. I also found when roasting blackberries, it made the fruit more easy to work with in recipes. Preheat oven to 425˚. 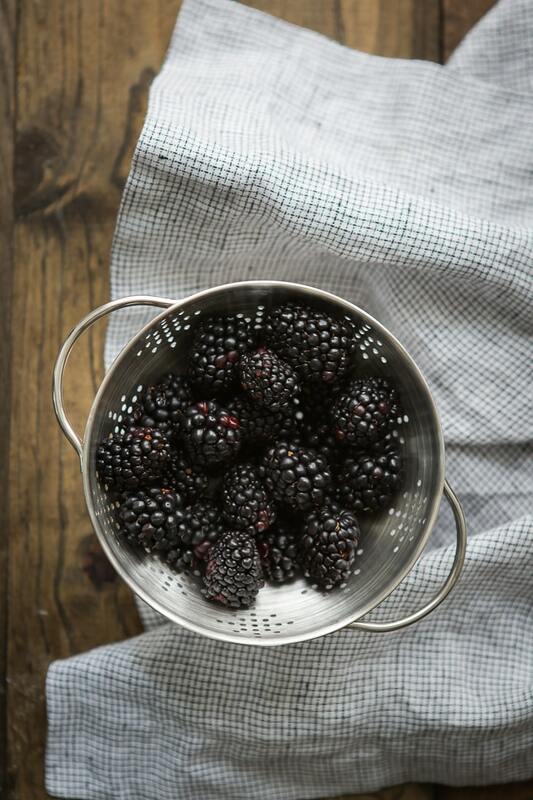 Combine blackberries with honey and lemon zest. Roast berries until tender, 15 to 18 minutes. Remove from oven, lightly smash/break apart and let cool slightly. Slice the pieces of bread in half, on the diagonal, and spread a small bit of butter on top. Place in oven and let toast until golden and crisp. In a small bowl, whip together goat cheese, honey, salt and pepper. 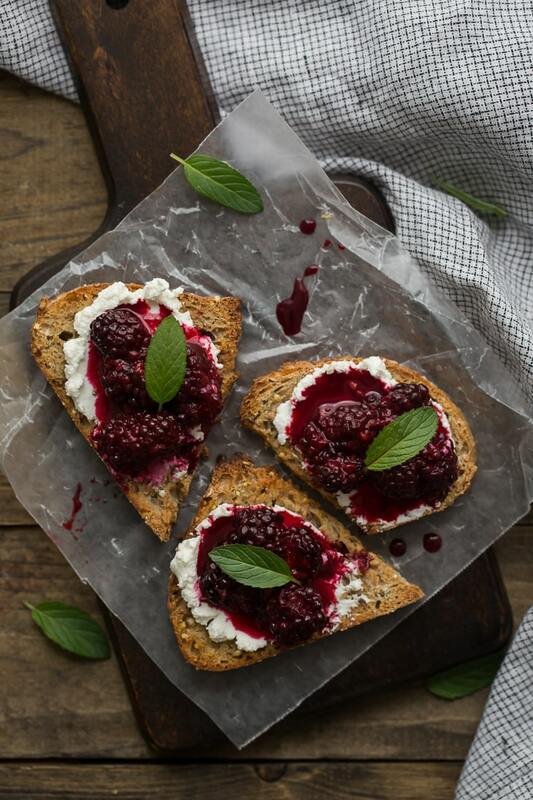 Smear pieces of bread with a smear of goat cheese, a spoonful of blackberries, and finish with a leaf of mint. Hmmm looks so yum, thanks for sharing! Oh my goodness- that looks amazing! I love goat cheese on anything and the berries would be a wonderful combination. I love goat cheese! Blackberries sound stunning with it! Love crostini especially in the summer! I just made something similar to yours for an upcoming post, except with whipped blue cheese. Wasn’t sure about the blue cheese at first, but it goes surprisingly well with blackberries. As a side note, I have so enjoyed seeing your instagram pics of your little one! This looks so delicious. I haven’t tried goat cheese but will be trying it now. The blackberries at my market have been particular delicious, sweet, and juicy this year. This looks like a perfect way to enjoy them. Beautiful! Great combination here, the sweetness of roasted blackberries will compliment the tartness of goat cheese. Lovely crostini, a great idea for parties! Oh wow, Erin! These crostinis are beautiful and delicious! Thanks for the inspiration Erin! I saw this post and had to make a little trip on my break to the whole foods store to get blackberries. They were on the expensive side so I got blueberries. I followed the same recipe pattern and ended up with a fantastic treat I’ll look forward to having more of this summer. Move over ice cream. Hellooo goat cheese and berry crostini! I’ve recently discovered the glory of goat cheese. Can’t wait to try it with blackberries, thanks for the recipe! We are almost vegetarians and are happy to have new ideas. I have lost 40 pounds and recognize that I am much healthy eating your way. I have two to try this weekend. This one is a summer winner.